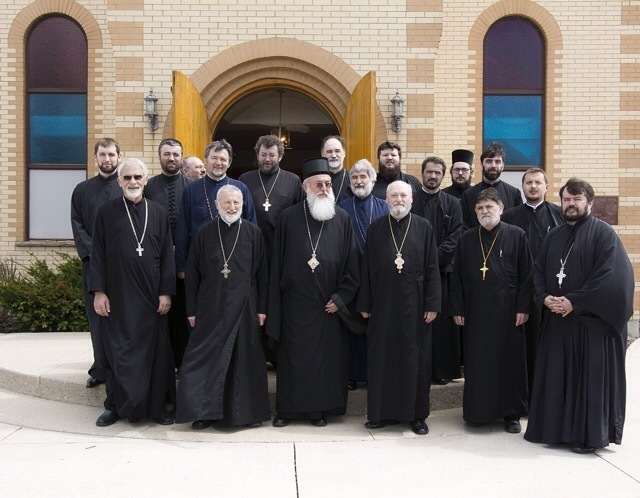 Toronto, Ontario - Bishop Longin, President of the Episcopal Council of the Serbian Orthodox Church in America, and on behalf of His Holiness Serbian Patriarch Irinej, administrator of the Diocese of Canada, held a meeting with the clergy of the Canadian Diocese on May 1, 2015. Implementing the decision of His Holiness Serbian Patriarch Irinej, administrator of the Diocese of Canada, to make the clergy of this diocese aware of the decision of the Holy Synod of Bishops of the Serbian Orthodox Church (No. 416/Minutes 257, dated April 20, 2015) in which His Grace Bishop Georgije of Canada has been temporarily released of administrative duties of the Canadian Diocese until completion of the initiated canonical procedures, or, until the final decision made by the Holy Assembly of Bishops, V. Rev. Stavrophor Vasilije Tomic, as Episcopal Deputy, called a meeting of clergy of East Canadian Deanery of the Canadian Diocese. The meeting was held on Friday, May 1, 2015 at St. George Church in Waterloo and attendance was exceptionally good. Clergy took part in the meeting while those who were unable to attend for justifiable reasons submitted their valid excuses. Attending this gathering was His Grace Bishop Longin of the New Gracanica and Midwestern America Diocese, as President of the Episcopal Council of the Serbian Orthodox Church in North and South America. The clergy awaited the Bishop in front of the church and following a prayer service for a successful meeting they went to the church hall, where they were advised of the current issues to which suggestions were given for an expedient decision. A high level of brotherly solidarity was shown and hope was expressed that order and stability would return to the Canadian Diocese and that the Church would weather the current temptations. The clergy showed great resolve in eduring their witness, for which they have much support from the honorable Orthodox Serbian people of Canada.